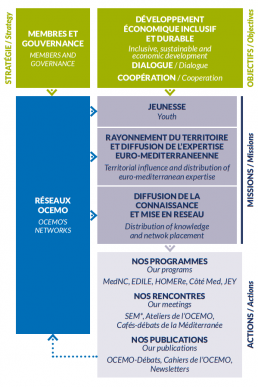 OCEMO takes action to propose a concrete answer to the young Mediterraneans expectations, mainly about unemployment. It concentrates its action on the inherent problems of their training, their professional insertion, equality between men and women and entrepreneurship. OCEMO adds value to the expertise of its partners, organizes meetings between economic workers in the region and enhances the development of partnerships.